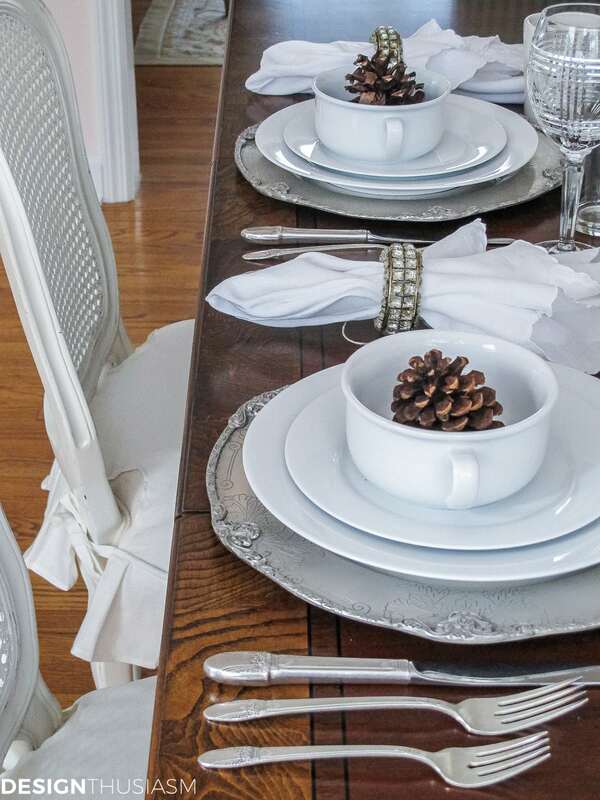 As many of you know, I do a monthly tablescape series with a group of my blogging friends called “It’s All Set”. 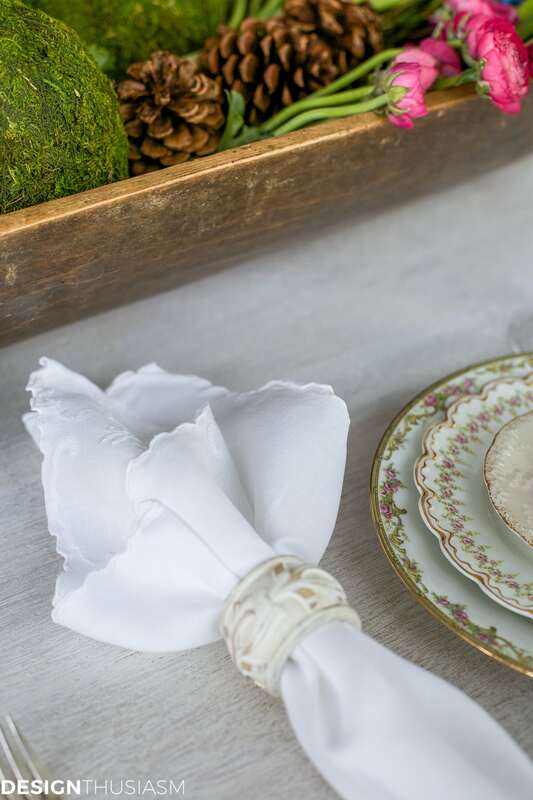 Today is our first post of the year and I truly set out to style a winter table for January with all white dishes and a neutral dough bowl centerpiece. But something happened when I got to the flower shop and my pulse quickened when I saw what was on display. What can I say? I couldn’t help myself! I got to the market and there were hyacinths! Grape hyacinths in January!! I tried to look away. Really, I did. But to me hyacinths are like dark chocolate. I just don’t possess that kind of willpower. And once the hyacinths were in the basket, well, it was a small leap to the magenta wax flower and the next thing I knew the basket was filled with pink ranunculus. I mean, really, is there ever a reason to walk away from pink ranunculus? So, here are the vintage dishes that started it all. 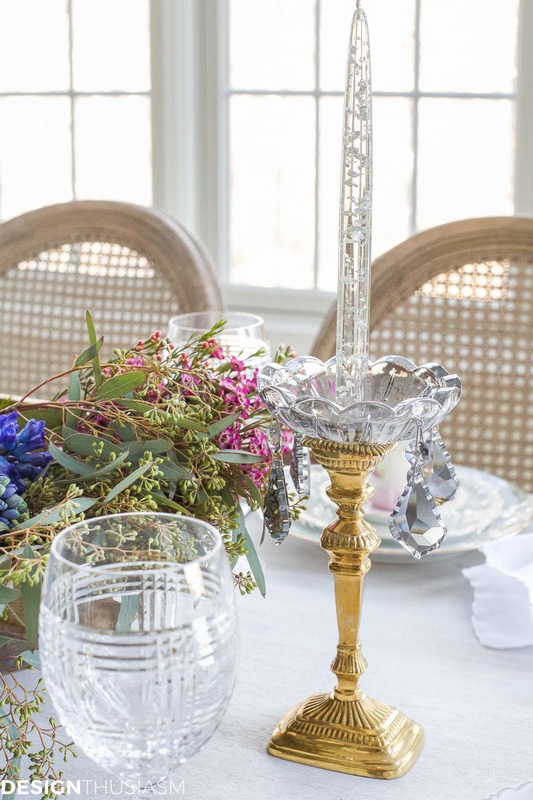 You all know I love to mix my vintage patterns and this entire table was inspired by the middle salad plate with the ever-so-delicate tiny flowers bordering the scalloped edge. 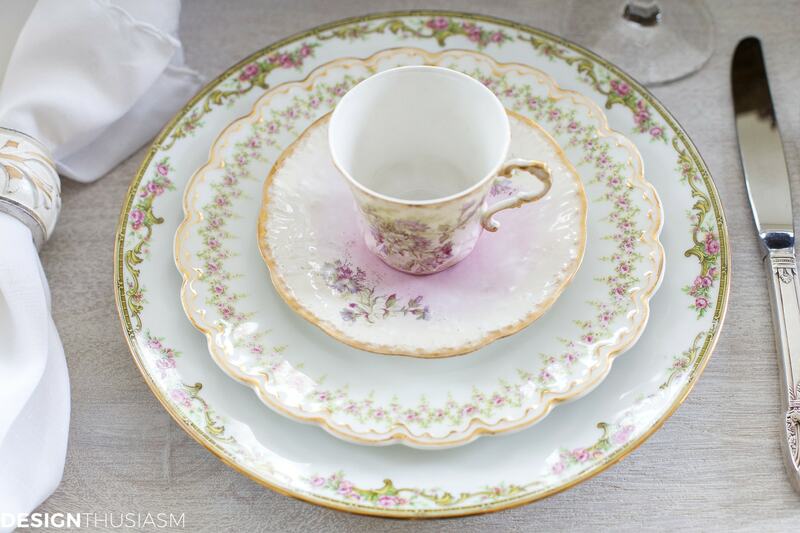 They actually worked perfectly with my existing Limoges dinner plates and I topped the stack off with one of my favorite purchases, the sweetest little demitasse set that I found in an antique market in Paris. I can still see them buried on a dusty shelf where I asked the shopkeeper to pry them out from. Honestly, they took my breath away. 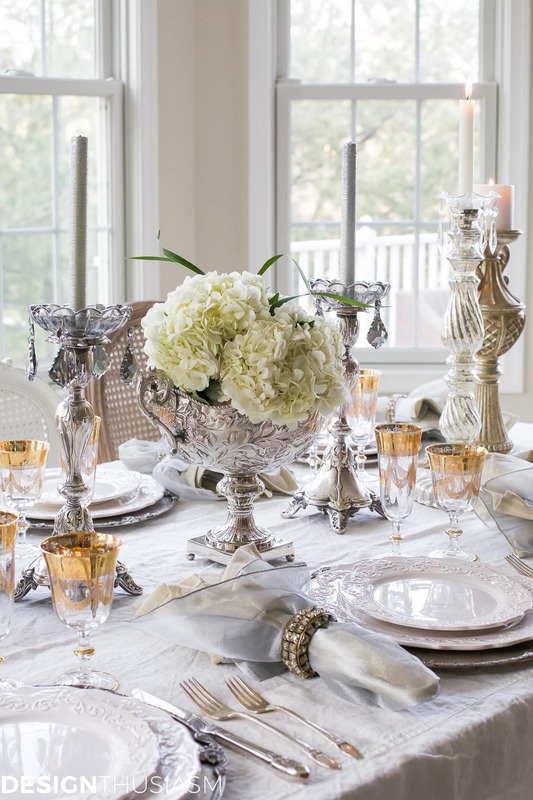 And because I wanted the vintage dishes to take center stage, I chose my clear crystal goblets in the glen plaid pattern as all they needed to do was to reflect the light. My embroidered white napkins are also vintage and they were recently bleached to freshen them up. 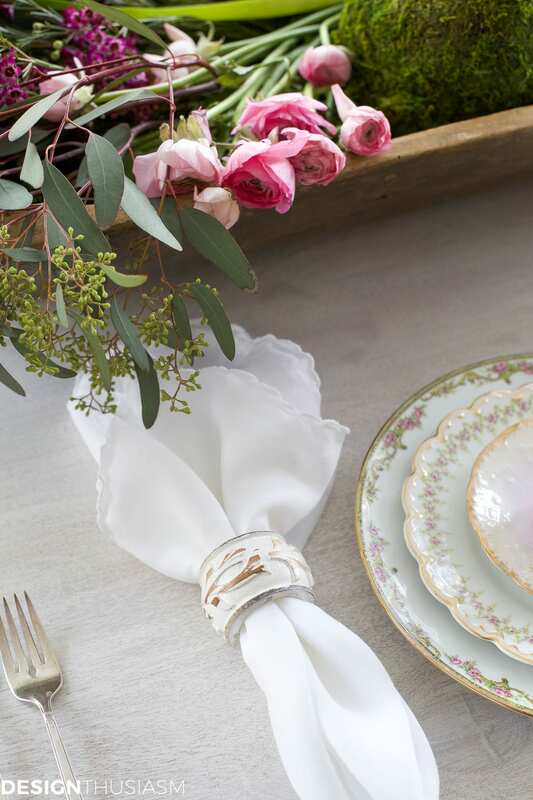 The chippy white napkin ring kept everything tonal. I used vintage brass candlesticks with smoky grey bobeches and acrylic candles with silver flecks. And then the piece that I was so excited to unveil was this gorgeous new-to-me antique dough bowl purchased from my friend Cindy’s shop, at Edith & Evelyn Vintage. You must take a peek at her amazing finds. I purposely kept the table bare to play off the patina of the old European bowl. But as I went about styling my dough bowl centerpiece, it really began to look like spring was in full bloom. I mean, who could blame me? 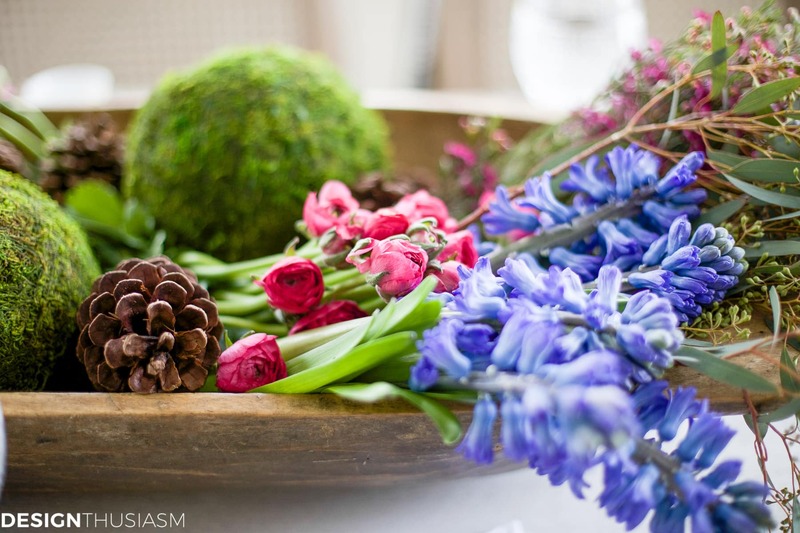 Hyacinths and ranunculus?? I’m simply not that strong to resist. Please take some time to look at my friends’ tables below. A few of our co-hosts are tying up some loose ends after the holidays, so we’ll return with a full crew next month, but for now enjoy what Janet and Jennifer have brought you! Just beautiful,the dishes are exquisite! Love Edith and Evelyn,one of my favorite blogs. The table is beautiful. 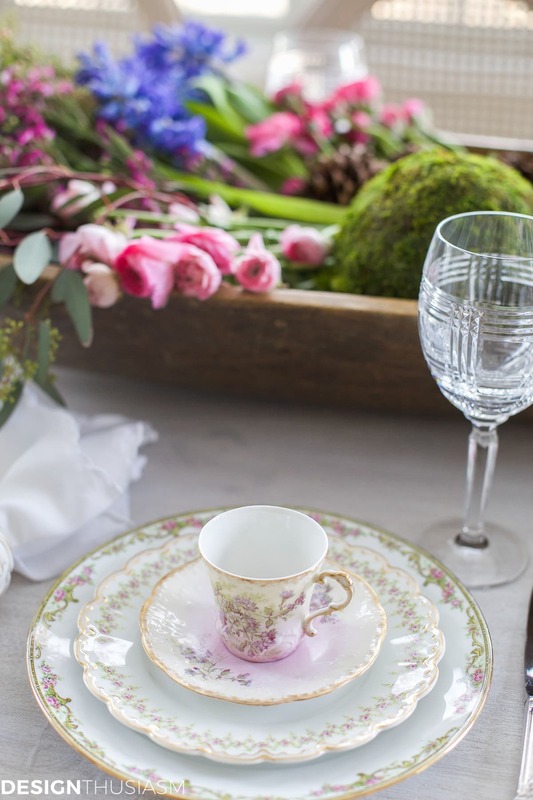 Love your dishes and particularly the demitasse cups and saucers that appear to have a touch of lavender. Thanks for the tip on Edith & Evelyn! Really pretty Lory! I know how you feel about flowers. I was shocked to see tulips in my local grocery so I had to come home with them. It feels like spring. I love those vintage dishes. Lory, I love your casual elegance. I have not seen acrylic candles before. Because the flowers are fresh, do you put a wet floral block in the bowl or floral water tubes or are they for the photos and moved after ? Really lovely. I can see why you couldn’t leave them. If I’m doing the flowers for an event, they will usually stay through the event without water and then I move to a vase later. For this shoot, they stayed overnight without water and I moved them the next day to a vase. But if I wanted to keep them in the bowl, I would have used foam. Lovely! I was impressed by those beautiful candles. Everything pictured makes me long for Spring! I love the way the glowers are laying in the dough bowl like you just came in from the garden. Your chins is dreamy. A lovely, light table reminiscent of spring. That should be “flowers”. I’ve pinned the dough bowl for future reference. Omg, how I love the smell of hyacinths! Beautiful as always! Love how your new kitchen and breakfast area is providing stunning foundation for your pretty pieces. Where can I find these smoky grey bobeches? Thanks, Hilary! The bobeches are from a tiny shop in Mougins, France, so you may need to talk to Josh about that… 😉 I have seen many online, but they’re often plastic or acrylic. These are a thick crystal so I wish I could find a source here for them. Will certainly post about it if I ever do. So pretty, Lory! I’m glad you got swept up by the colorful flowers and changed your plan a bit. The color really pops in the center of your white setting. 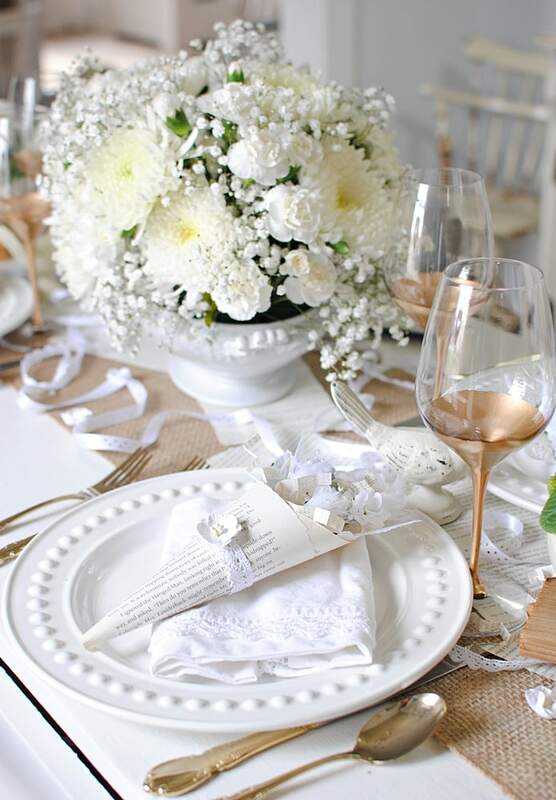 Your table settings are always beautiful. 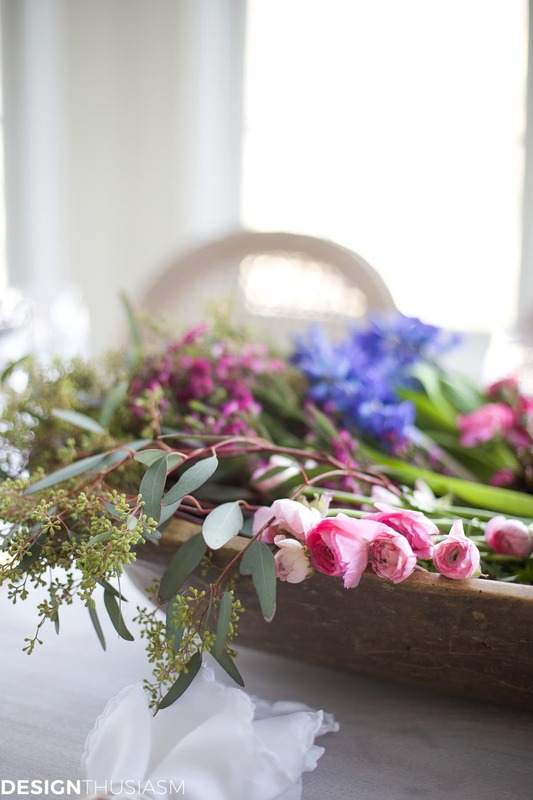 Such a lovely tablescape and I adore the color in the flowers, which is so needed right now. By the way, I know there is concern about the lead content in antique china. Do you serve with your pieces? Thanks, Donna! Most of the time I use the patterned plates for the salad plate and layer it on top of a solid white dinner plater, so I mostly serve on the dinner plate. However, I do have a few full sets of china and I do occasionally serve on them. Never really heard you weren’t supposed to. 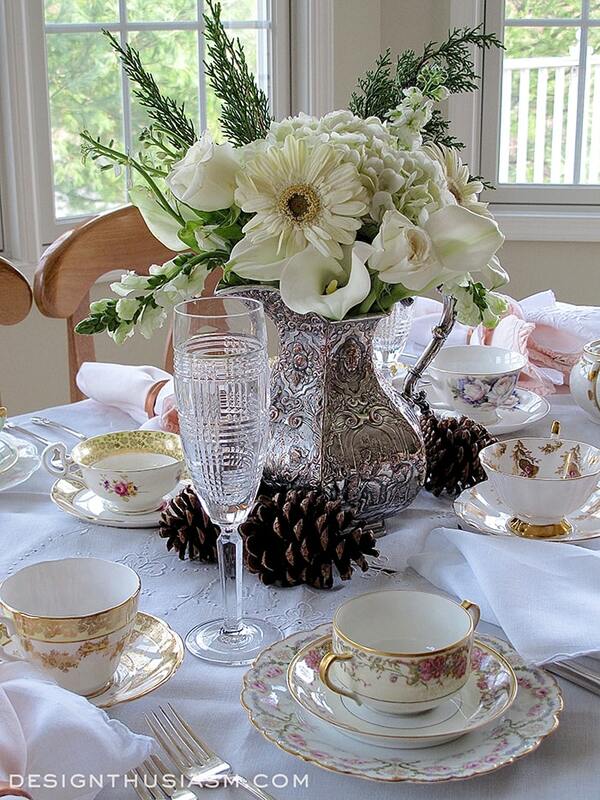 Love, love, love your vintage dishes, especially the lavender flowers! Lory, I love your blog…one of my very favorites. 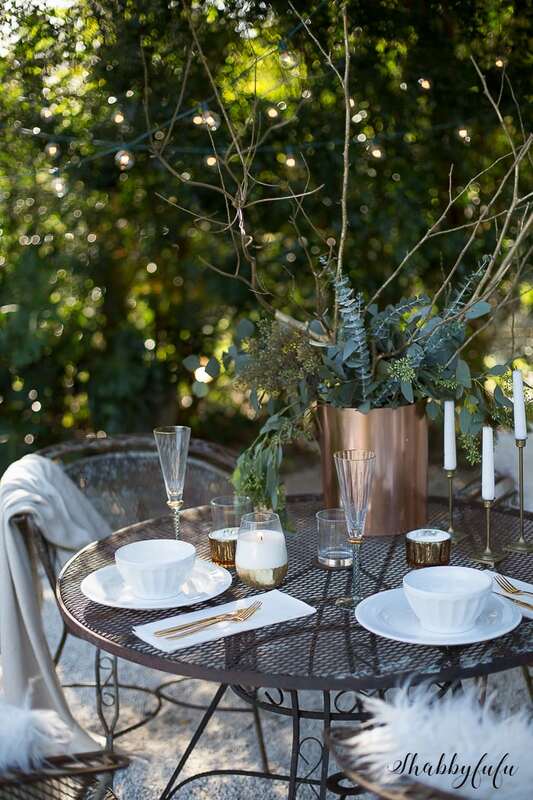 Your tablescape posts are amongst my favorites as well. I save each and every one of them as reference. 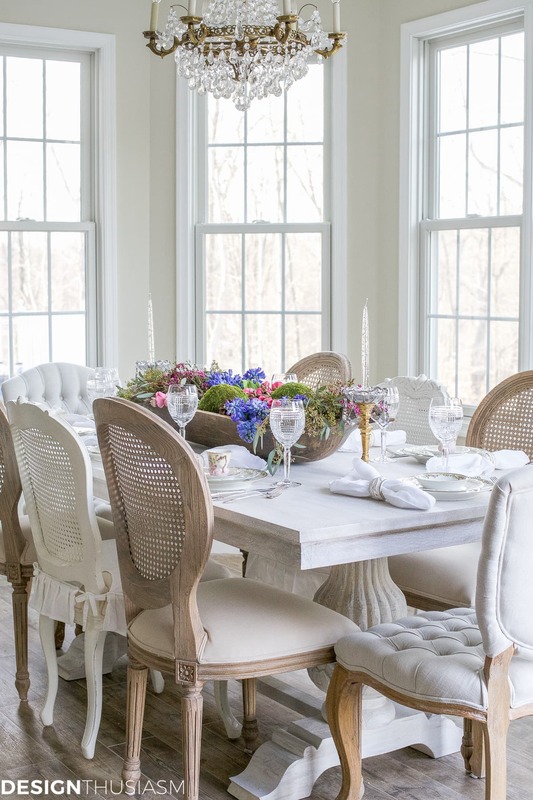 I truly love this “all white” winter tablescape and I’m sure if you’d filled that antique dough bowl with white roses, white hyacinths, etc. I would have loved it and thought it beautiful. 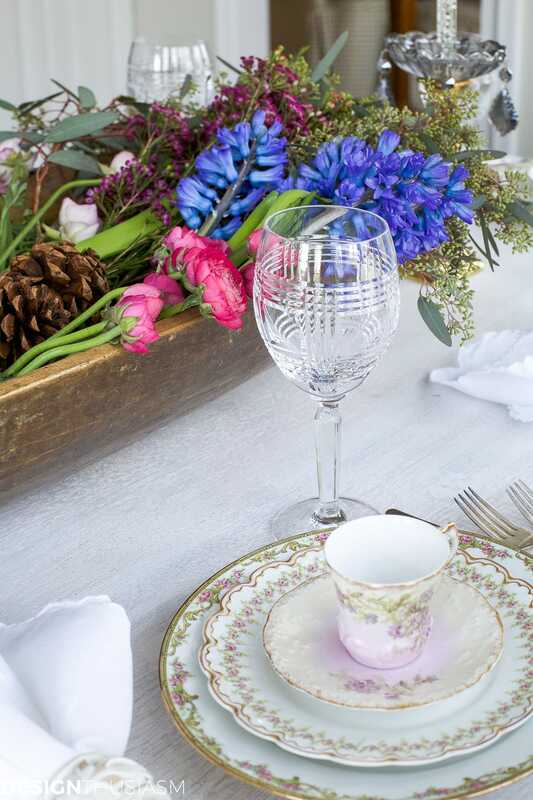 However, your choice of pastel spring flowers really set off the white motif of your table setting and elevated its design to exquisitely beautiful. Just perfect. Gasp! Such a pretty post Lory! Walking away from these beautiful flowers would have been an impossible task and I’m happy that you didn’t. 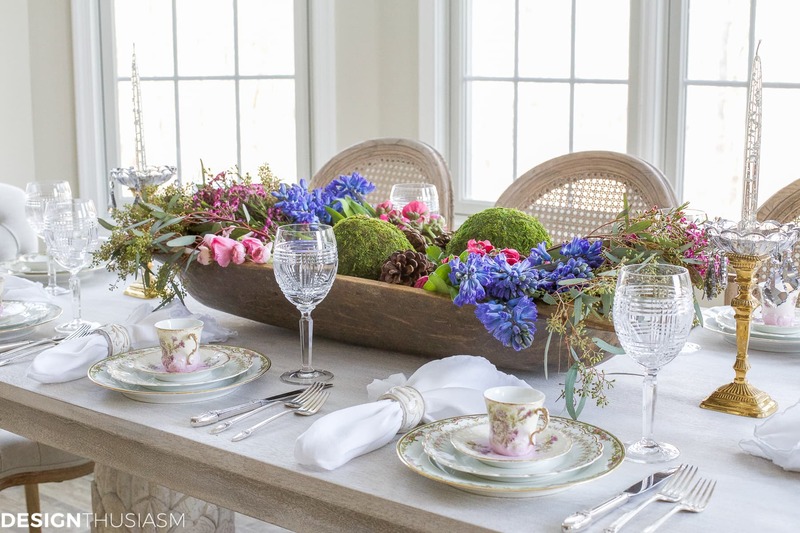 I know we have lots of winter weather left here in Michigan but looking at this pretty table is pure joy. Thank you! Stunning, stunning, stunning!! I just discovered your blog and feel I have met a kindred spirit. Thank you for the inspiration! Thank you so much for the lovely comment, Alecia, and welcome!!! 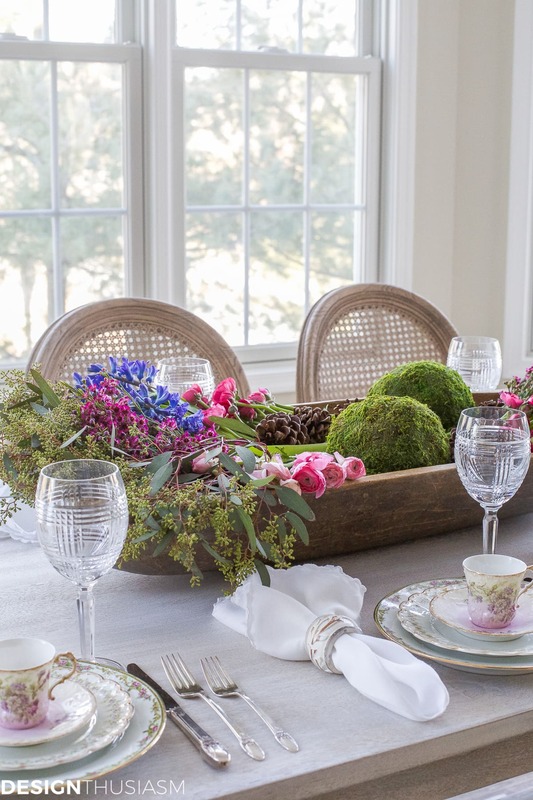 This beautiful table is a breath of fresh air filled with spring wishes! Oh my! Those lovely florals in the dough bowl are like a breath of spring air! Beautiful! 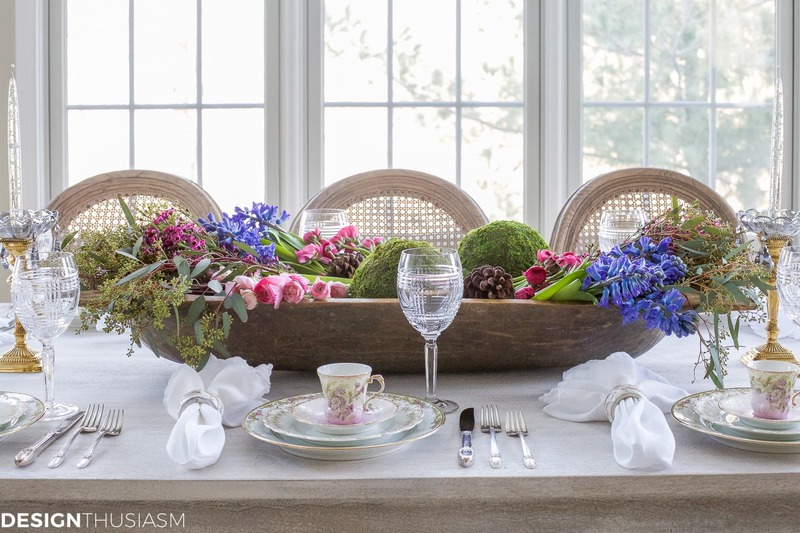 Gorgeous flowers, plates and photography!